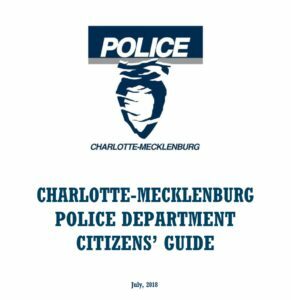 The Charlotte-Mecklenburg Police Department’s (CMPD) Citizens’ Guide is a useful reference for the many resources available to residents of the Charlotte-Mecklenburg, whether you’re new to the Charlotte-Mecklenburg area or have lived here for many years. The Citizens’ Guide provides contact information for the City of Charlotte, for Mecklenburg County, for the Sheriff’s Office, for the Charlotte Fire Department, for Juvenile Services, for State Agencies, for elected officials and Charlotte City Council and Board of County Commissioners, for foreign language/immigration resources, and much more. It also provides information about how/when/where to contact the Charlotte Police Department, when to contact the Mecklenburg County Sheriff, as well as provides answers to questions about the Charlotte-Mecklenburg Police Department. 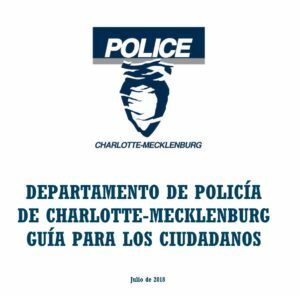 The Charlotte-Mecklenburg Police Department CMPD Citizens’ Guide is published in both English and Spanish. Click on the pictures below to see a copy in whichever language you prefer. Mecklenburg County includes the incorporated and unincorporated areas of Charlotte, as well as the towns of Pineville, Davidson, Huntersville, Cornelius, Matthews, and Mint Hill. These towns are all served by the Charlotte-Mecklenburg Police Deparment and/or the County Sheriff’s Office, as well as by their own local police departments. 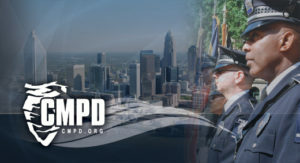 This information about the Charlotte-Mecklenburg Police Department Citizen’s Guide is provided by Nina Hollander/Carolinas Realty Partners with RE/MAX Executive, your Charlotte metro area residential real estate experts.